This is in line with a pattern: when I see a painting that reminds me of Trionfi cards, the date on that painting is more likely to start with 13 than with 14. Either that or the category is woodblock. It seems when I uploaded the image of the cassoni in my last post I used too high a resolution. Oh well, I know now. I freely admit the earlier versions of Diana at her bath (seen by Actaeon) and even the Venus exemplar are likely variations on courtly love and the medieval Garden of Love theme (not planetary Venus or the moon, in Diana's case), but the theories about the rules of attraction (see Dante, for instance) and the radiating nature of planetary influences naturally lead Venus to being the gateway planet to full-blown interest in astrology. Malevolent planets and their influences were more obscure, and bound to be brought up only when something failed. But fools in love are everywhere and at all times - pinning that irrational influence on a planet only made sense, especially when the Good Book was hardly going to adequately explain such matters. 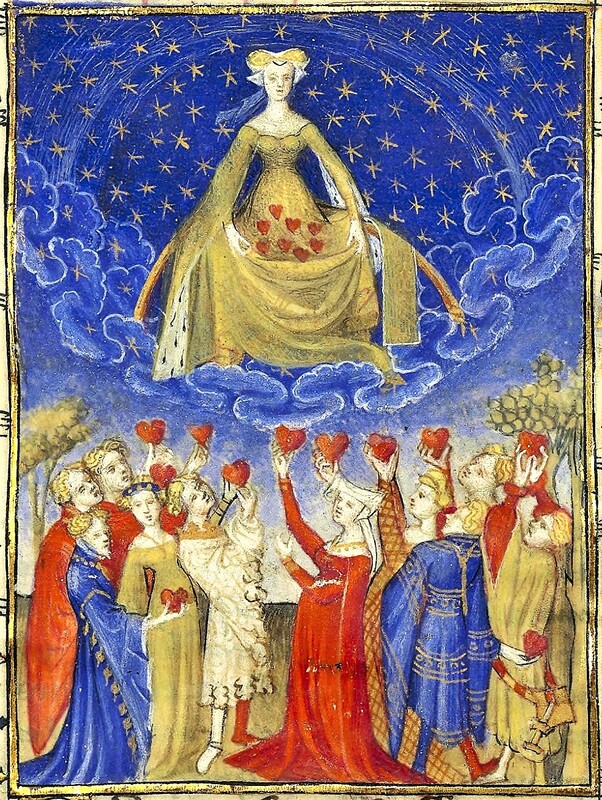 Some other early depictions of "love from above" (clearly indicating love's influence was other-worldly, if not explicitly planetary, as in the second Christine de Pizan example below, c.1410). A minor point, but needing to be said lest others repeat it, is that Ottone was not the founder of the Visconti dynasty. He was the one who got it in control of Milan. The dynasty has a preceding existence that can be traced back at least to Ariprando, who first got the title of Viscount, 2nd half of 11th century. See https://en.wikipedia.org/wiki/Visconti_of_Milan, which seems documented enough on this point. I think it depends on where you are talking about. Birth trays and cassonni were primarily Florentine. So yes, that cards reflect birth tray scenes after the cultural shift is a consideration in favor of dating cards of that location to that period. However some tarot themes did get on at least cassoni, namely, the seven virtues, love, and fame, perhaps also chastity, considering Diana and her nymphs. With Fame came emperors, empresses, popes, and charioteers. For the Angel/Judgment card, there is enough similar imagery in sacred art. That is almost enough for a deck, if we concede that we don't know how many triumphs there were. In Milan, it seems to me that subjects of poems is good enough, to suggest those subjects not represented much in art. Any tarot there would have been designed for Duke Filippo Maria, who we know was interested in such things, based on the reports about Marziano deck. In that case we do not have to presume any fashion for certain imagery in art creating a demand for similar imagery in cards. An interest in Petrarch implies an interest in Padua, where Petrarch last lived (after Milan), not restricted to contemporary themes. And of course Filippo was interested in astrology, which was a big theme in Padua, too (although I fail to see it represented in the Cary-Yale or Brera-Brambilla). The imagery in Petrarch's poem might also be relevant, for example for Chastity (not Laura's, to be sure, but that of a chastity not soiled by marriage) and Time. In that case the image of the Sun might have been suggested for a card, rather than that of an Old Man, as it is the dominating image of Petrarch's "Triumph of Time". For the World card, there is the contemporary interest in Arthurian themes, even by the same Cremona workshop. And the Wheel of Fortune was a dominant image for the Visconti, as Phaeded has shown. Now it seems to me we have enough for a deck, at least that of the Cary-Yale. One question, Sandy: why do you think the imagery of Petrarch's Trionfi is more 1410ish than 1440ish? And why 1410ish rather than late 1420ish, which seems well within the bounds of plausibility (at least it did for Dummett, 1993, and does so for me)? I apologize for the lateness of my comments. I get involved in other things and do not check the Forum as often as I should. I must have misspoken: I think that the images of the standard 21 trumps are rather pre-Renaissance, That is, between about 1410 and 1440, paintings started to have more Classical and mythological subject matter, even though poems had been full of Classical reference for 100 years by then. Perhaps this is something that everyone else knows, but my education missed it; I didn't know about it until I started making lists of painters by year of birth. In my list of artists with a few major paintings by each, the first painting with a mythological theme is Leda and the Swan, by Ghirlandaio born 1449. Now that I know what to look for, I know that Mantegna is a likely early one, and indeed he painted Minerva Expelling the Vices from the Garden of Virtue (although even that is not a myth). 50 years later and myths are all over the place. So compared with this timeline of subject matter of paintings, the 16 gods and goddesses in the Martiano game, ought to be in 1449 (the year of our actual source) and the 21 trumps, with only Fortuna and Cupid as gods, and subject matter like the devil and bodies coming out of coffins at the last trump, seems more like 1410. Not that I think either that Martiano's gods are 1449 nor that the 21 trumps are 1410. I just think that Martiano's game came in 1425 from advanced humanist circles, and the 21 trumps came in the late 1430s from a printshop that sold holy pictures to carpenters and weavers (and their wives). I am not advanced enough to talk about the difference in paintings between Milan and Florence in 1410. (If we were talking 1560 I could bore you on the subject of Florence+Rome vs. Venice and northern Italy for hours. Don't get me started on Mannerism.). I would never say of Petrarch's Trionfi, or of any poem, that it seems of some other date than it is; I lack a frame of reference. But the poets were a lot ahead of the painters. I am enjoying the forum immensely. I see where I caused the confusion: I've been avoiding "tarot" since that is another country and another century, and saying "trionfi" instead, and sometimes I capitalized it wrongly (influenced I suppose by all the people who capitalize "Tarot" for no very good reason). I will say "tarot" or "tarocchi" from now on, and make my Ts keep their heads down. To answer your question, the Martiano deck is indeed what I expect of the Viscontis, ahead of the curve in a Classsicalizing direction. 16 gods and goddesses in 1425. Very impressive indeed. So in 1440, what even greater marvels of humanist learning do we expect to see from this family? But what do we in fact see? Item: writing. The Martiano deck came with an explanatory text. The cards have all sorts of detail, such as that Jove holds the light "with which laws are given." which could not have been conveyed without writing. The tarot cards have no labels, and no numbers. Every image to which we now give a name, we know what name to give it, because someone figured out what to call it from the image. Conveying your point with images only is a skill which a woodblock carver needs to have. When did the Duke learn it? Why, unless he was designing a deck for the purpose of printing a thousand copies and selling them to weavers and porters, didn't he just put on labels? Item: Greek and Roman gods. Martiano has 16, Tarot has two, Fortuna and Cupid. If bona fide Roman gods can be medieval, it's these two. Item: Wheel of fortune. Medieval? You bet. It's in the Carmina Burana. Item: Death as a skeleton. Item: Devil. Item: Last Judgement. Compare these with the religious concepts in the Mantegna Tarocchi and you can see how much more humanist the latter is. The Visconti family could have used, and likely did use, concepts from Petrarch's Trionfi, to create their private family game. That is just what I expect of such advanced humanist circles. My question is not what private game they would have created, but what happened after that? Somehow, we go from a private family game, to cheap decks of “naibi di trionfi” sold in vast numbers by 1453 at least in Florence. Cheap and in vast numbers implies printed, and printing implies a printer. Maybe the printer bribed a kitchen maid in the palace for the rules. Maybe the Duke bankrolled the printer hoping to make some money from the family game. Now, those reading this might think that they already know what game the Visconti family would invent, because they think the Cary-Yale Visconti deck is that game. But we do not know that it was the first game. Ask instead: What qualities would a Visconti family game be likely to have? Our basis for this is the Martiano cards, so we could guess that there would be writing on the cards, and Roman gods and goddesses. Myths and images from Petrarch, Virgil, and Homer would be understood by the whole family, and so could be used in the game if they were wanted. So I think a game invented by the Visconti family for their own use would have been quite advanced in a humanist direction, and that such a game, when prepared for carving on wood blocks, would need to be adjusted to be less humanist (as well as the adjustments needed when the labels were dropped). Not only do I think that this adjustment would have been needed, I think it occurred, since I see the 21 trumps as much less humanist than the Martiano game, even though they are some 15 years later. But then the Cary-Yale Visconti deck is quite similar to the 21 trumps. Why is that? I think that is because rich people don't play special games, they play the same games anyone else plays, although with very ostentatious equipment. The parvenu freedman in Petronius Arbiter played on a gold and silver board, but the same game as anyone else. If a billionaire plays cards, it's poker. Where the duke's game was different from the weavers' game, it was the duke who adjusted, replacing the three Biblical virtues in his deck with the Star, Moon, and Sun from the decks the weavers used. Some theory assumes, that the Cary-Yale had 16 trumps, and 4x16 small arcana (6 courts + 10 numbers for each suit), together a 5x16-deck (that' demands a sort of minimal addition). 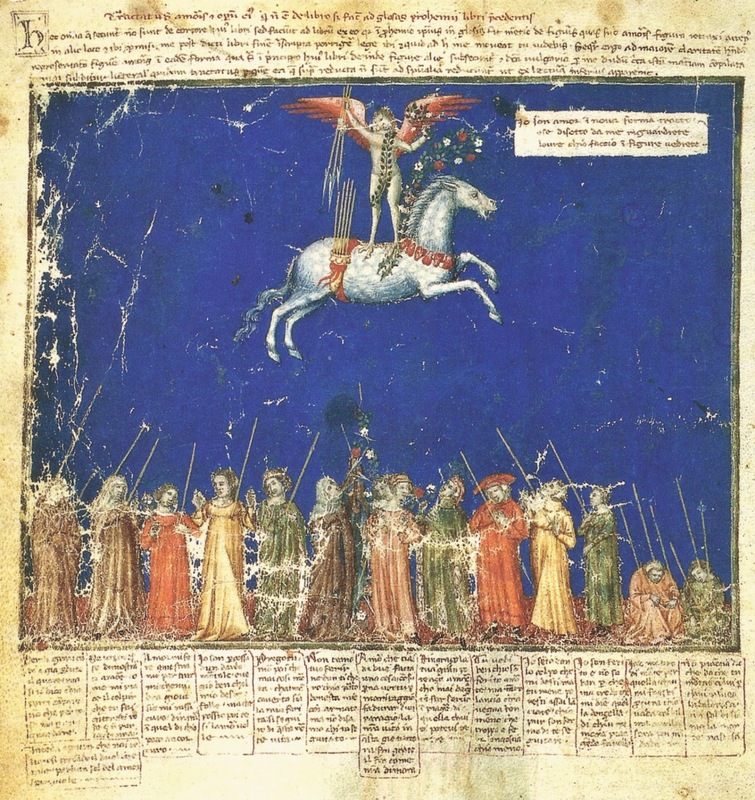 The Cary-YaleTarocchi fragment has 11 trumps (between them theological virtues, not part of standard Tarot) and as courts kings and queens and female and male knights and fante. Dummett's theory once had been, that the deck had 25 special cards - that was the maximal version, that assumed that 3 theological virtues were added to 22 normal Tarot motifs. How exactly did the humanist owner of the second largest library in Europe produce a deck of cards that screams holy picture on the wall of a weaver's cottage with every card? How did the family that made the Martiano cards make these cards? They couldn't have made them if they tried. That's what I see, when I look at the tarocchi trumps. Two things: (a) he got older and more concerned about life after death; (b) he had a child who was now of "first communion" age and receiving the appropriate religious instruction for confirmation. instruction that Filippo could relate to. He needed a game he could play with his daughter and mistress, showing how the virtues fit into the various goals of life, and what frustrates them, which are represented by the names of the Petrarchan triumphs. The imagery comes from the Middle Ages, yes. But the Chariot card, for one, seems to me definitely humanistic, straight out of Plato. You don't really have to have read the sections of Petrarch's poems to know their order and general themes; just the titles of the six sections are enough, plus the "triumph of fortune" familiar from numerous sources. The imagery on the cards (and even the iilustrations of the poem on cassone and in manuscrips) doesn't fit the content of Petrarch's six sections very well anyway. We are only talking about the Cary-Yale, I presume, and just the cards that are preserved, even though surely there were at least a few more. I am not saying that this is what happened, just that it is a plausible explanation for the religious and moral emphasis, which I fully agree with. You mentioned that Petrarch was in Florence rather than Milan. Actually, Petrarch spent only the earliest part of his life there, and in fact for about 8 years served the Visconti as their ambassador at various courts (See https://www.questia.com/read/3572118/pe ... s-in-milan). At his death (near Padua) the Visconti got all of his library except his own works. My question is not what private game they would have created, but what happened after that? Somehow, we go from a private family game, to cheap decks of “naibi di trionfi” sold in vast numbers by 1453 at least in Florence. Cheap and in vast numbers implies printed, and printing implies a printer. Maybe the printer bribed a kitchen maid in the palace for the rules. Maybe the Duke bankrolled the printer hoping to make some money from the family game. We don't know, of course, but it is not hard to imagine plausible scenarios. Filippo gives decks of tarot cards, to people he wants to reward such as condottieri that he wants to keep even though he is paying them substandard wages. Perhaps he even has a few cards painted with scenes relating to the person he's giving them to (i.e. the CY "World" [really Fama]] card) A known example is the painted deck given by someone in Tuscany to Malatesta in 1440. The soldiers under the condottieri hear about these gifts, and want to play, too. Hence a demand for cheaper cards. One particular condottiere, Francesco Sforza, leaves Filippo's employment (around 1436, I think) and goes to work for Florence instead, taking his soldiers with him. So Florence hears about the game, creating more demand for this new deck. Or it came from somewhere else, or was invented in Florence, although I don't anything to suggest that much before 1440. The pre-1440 evidence, admittedly circumstantial, is from Milan , home of the Marziano deck, documented not only by Marcello but by Decembrio and by Marziano himself in his treatise, even if, since it is part of the same packet as Marcello's letter, he probably sent with the letter. Then Florence, 1440, not a cheap deck, then 1442 Ferrara/Bologna, medium priced, then 1443 Florence, probably cheap, since it is being played illegally very near the Florence jail, indiscretely enough to get the players arrested. Franco Pratesi has a note about that. But cheap ordinary cards were made long before. Hind in his book on the history of the woodcut has a note about a woodblock card maker in Florence of 1428. What writing? Well, there is a little, like "Amor" on the Love card, according to Cigognara's sketch; I didn't know about "Caritas": where is that? But the important thing is the numbers, which give the order. and there weren't numbers even on ordinary cards, until around 1500, or maybe 1490, since the Sola-Busca has numbers. Then it's just numerals, easy to carve. Before that, the order has to be memorized. The point is Christian education of a traditional sort, not Bridge or the humanism of the previous deck. If it were just for a game like Bridge or Whist, they would have had some indication of the number, at least,, and then the subjects on the cads would have been irrelevant and probably have shown more variation than they do, like with the "animal tarock" of 18th century Germany. As it is, we only have two varieties, first the Marziano and then the more religiously oriented deck of the CY.. Later some rather irreverent additional cards start showing up. To play the game, you don't really have to know the names of the cards, only the order of the sequence, although knowing the names helps some people, those who are verbal rather than visual, to remember the order better. You might also have had to know which suit the trump is associated with, if it is structured like the Marziano. But there is a rationale, absolutely unwritten, necessarily memorized - and not simply by rote, because there is a didactic rationale. Yes, a grid. not only 7x7 + 2 but also 4x4, i.e. four groups of four, as in Marziano's game, with at least one Petrarchan and one virtue in each group. It is passed down, let us suppose, from Filippo and family to his court and condottieri, and from the latter to the soldiers, perhaps. As it spreads to more people, what needs to be memorized gets simpler; in Florence you don't have to know any related suits, and a different rationale with a different order develops, easier to remember, but also not deducible from what is on the cards. It doesn't have to be the same everywhere, even everywhere in the same city, as long as players play with the same group of people all the time. Again, remember that the game is illegal, even though the law proves, at least in Florence, not to be enforced unless in blatant disregard for the law (such as playing outside the police station or on the steps of a church). But the Christian framework is part of what allows the game to be tolerated by the more elite clergy of the Church, along with the skill required. Then when it is established, the card makers can liven it up for the masses and add some crazy, Carnivalesque cards, like the Fool, the Magician, the Popess, the Hanged Man, the Devil, the Tower, and so on. As far as the Visconti playing the same game as everyone else, we know from the Marziano game that that wasn't the case. This game would not have appealed to the masses, as you say. Otherwise, it's difficult to generalize. Given that the rules were probably not disseminated by a rule-book, it would probably depend on where - iin the sense of milieu - it started. Thanks for this long and thoughtful reply. Does anyone know if the ordinary naibi of this date (say 1450) had 56 or 52 cards? that is 3 face cards or 4? Or is it some other thing, or some of each, or is that wholly unknown? My point about the writing is that the Martiano deck either had writing on the cards or came with some explanatory text (I think this is known, but in any case you can tell from the descriptions: this is detail an image could not have conveyed.) Therefore, the game which the Visconti's would most likely have invented (leaving aside for the moment what we think we know about what they did invent), would most likely have had writing on the cards, lots of it, not just AMOR (which might be a kid's scribble). The game they would have made would have had humanist concepts, I think. The game would have had images, which could not be understood by looking at the image, but required a label or an explanation. Such a game, when made ready for the printer, would have needed to be changed. So I see two games, the one I think the Visconti family would most likely have invented, with writing and humanist concepts and images hard to understand without the labels, and the other game, a game that a printer could have made and sold, with no writing, and medieval concepts, and concepts that could be understood, from the images. Of these 2 games, I think the later 21 trumps look like the printer's game, and CYV and VS are each pretty much a subset of those 21 standard trumps. So there are two possibilities, each with some implausibility. First, I'm just wrong, and the Visconti family made CYV for their own use, without concern for whether ordinary people could understand it or not, and yet just happened to use no writing, just happened to choose images which could be understood from the image without an explanation (even though they could have explained them), and just happened to use medieval rather than humanist images. The other possibility is that they made a game (unknown to us) more like the Martiano game. This game was adjusted to be suitable for printing and sale. It sold well. They wanted to play the same game the rest of Milan played. They paid for a gold leaf version of the game everyone played, rather than a gold leaf version of the game that only they played. Therefore CYV was after, not before, the first printed naibi di trionfi deck. Of course, if CYV was a copy of the first printed trionfi deck, that printed deck might not have come from the Viscontis at all. I am not up to speed on date evidence. Wikipedia seems to think that the use of a particular coin is the best evidence there is for an early date. I know there are documents of buying decks of cards, but I don't know if these were the decks which survive. So perhaps you can tell me of good evidence that CYV is too early for my theory to be true, my theory that it is after the first printed decks. I find your idea that a older man concerned with his children would use religious concepts rather than secular ones very interesting. But there aren't any saints in the trionfi cards either. Of all the sweet religious stories I have seen on so many paintings, the religious concepts in tarocchi seem darker and different in tone. Death, the Devil, and bodies rising out of graves in the Last Judgment. No scenes from the life of Christ. No John and Jesus playing. The tone and concepts of tarocchi seem to me to match best the poems of the Carmina Burana. An old duke might well have such thoughts, I suppose. I am not at all against the idea that Petrarch's Trionfi count among the ideas that went into the cards. But I note that while the Triumphal Chariot card is a classical concept for sure, it is the only chariot, while the many illustrations I've just looked at, have six chariots. Some of the fits between Petrarch's Trionfi and naibi di trionfi seem better than others, but that is not something I have looked at systematically yet. About "Caritas" sorry -- it is the Tarocchi de Mantegna caritas I was thinking of. I was getting a bit goofy writing that imaginary dialog. My point was that if you make labeled images, you will not ordinarily make them so they can be understood without the labels. The Tarocchi de Mantegna, for example, are incomprehensible without the labels. The Viscontis had no reason not to use labels, they would have used labels, the printer would not have printed the labels, and the resulting images would have been incomprehensible. Each of those steps seems of high probability to me. And yet the unlabeled tarochhi images are not incomprehensible; I think that needs an explanation.